The opinions expressed below may be offensive to some; continue reading at your own discretion. I think this is the fourth time I've tossed my hat into the presidential campaign ring. As you can plainly see, I have been unsuccessful in my bid three times. Perhaps the fourth will be the charm. ALL gas tanks will be filled from the driver's side--no exceptions. Why haven't manufacturers come to that conclusion themselves? No more jockeying for a spot at the pumps. ALL convicted prisoners will be microchipped. No exceptions. We spend millions of dollars tracking escapees; microchips will eliminate the need for manhunts and pay for themselves many times over. There will be a child-free shopping day each week. That's right, plan ahead, because no children will be allowed in any shop on the designated day. And perhaps that day will also be cell phone free, as well. Remember the good old days of leaving home to get away from screaming kids and the ringing phone? What was wrong with that? Remember turn signals--or when people used to use them more often? It's not like we have to stick our arm out the window in all kinds of weather before the invention of turn signals. My suspicion is that there was more signaling in those days than now. And why are turn signal lights so small? Most cars are bigger but have smaller lights. Why is that? This is just the beginning of my campaign. Let's get the word out. Stroud for President! And I am going to be the first tiara-wearing president. And I may carry a wand scepter. The Queen shouldn't have all the fun! A sort of not well-kept secret is how much I love tiaras! Let's face it, there are not many opportunities in real life to wear one. My favorite episode of The Big Bang Theory? The one where Sheldon buys Amy a tiara! Just too funny. And the other half. That's Penny waving so majestically because she just won Quilto! It's very serious. 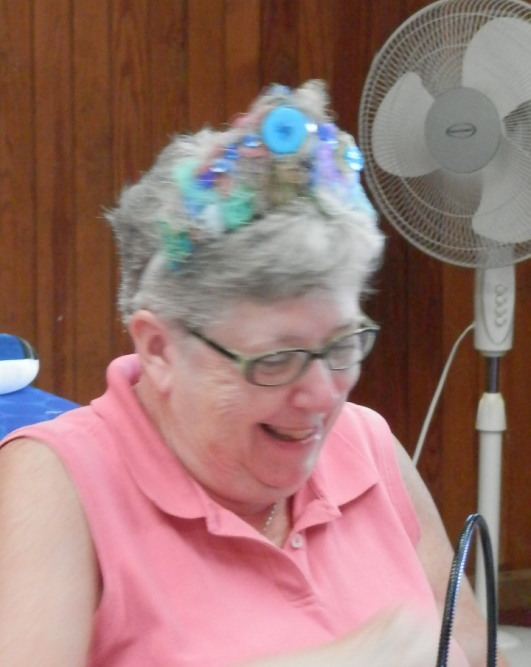 Emily was the winner of the tiara contest. 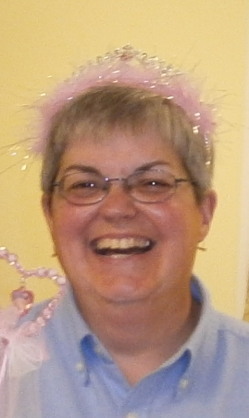 Her tiara is embellished with threads and all kinds of embellishments. Such a regal air! Here they are, all hard at work. Here's the Stroud Posse with their finished Rose Star blocks. Hand pieced, of course, using freezer paper templates from Linda Franz at www.inklingo.com. Linda has designed programs where you can actually print on the wrong side of your fabrics, eliminating the tracing part. 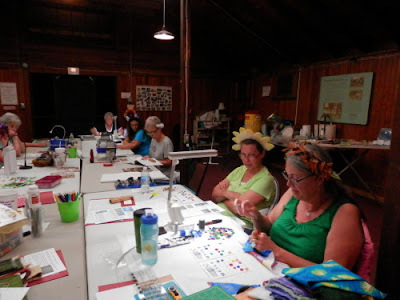 We could not do that at our retreat, but we did use custom designed freezer paper to complete our blocks. Thanks, Linda! And a close-up of Terri's almost completed block. 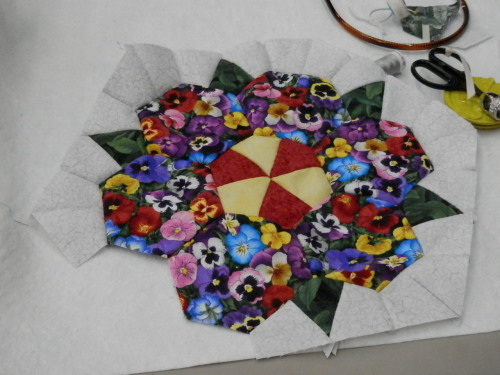 The pansy fabric was perfect for this, and she has already cut two more versions to make a runner. P.S. I am listening to Cane and Abe by James Grippando. 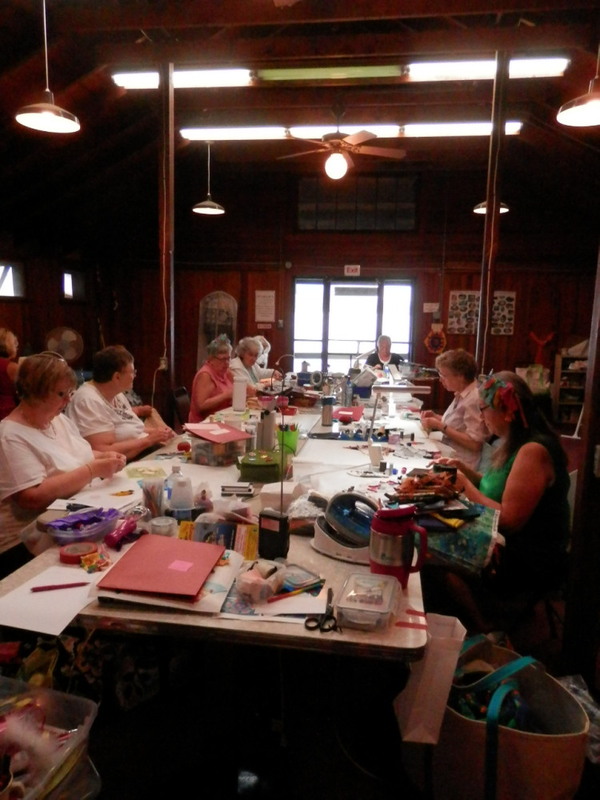 A few weeks ago, I was lucky enough to spend some time with like-minded quilters. Here are some pics of what they have been accomplishing. 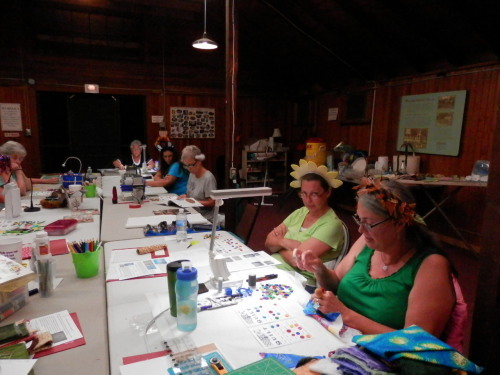 First, Cindy O. who finished hand-piecing her 32-point Mariner's Compass. This is a design I taught about three years ago. 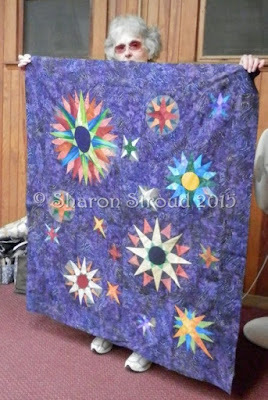 The fabric for the eight main star points is just fabulous and brought the entire design to life. Emily had not one, but two, flimsy-nots! First is Monthly Bliss Doubled, the perfect mix of hand piecing and hand applique! 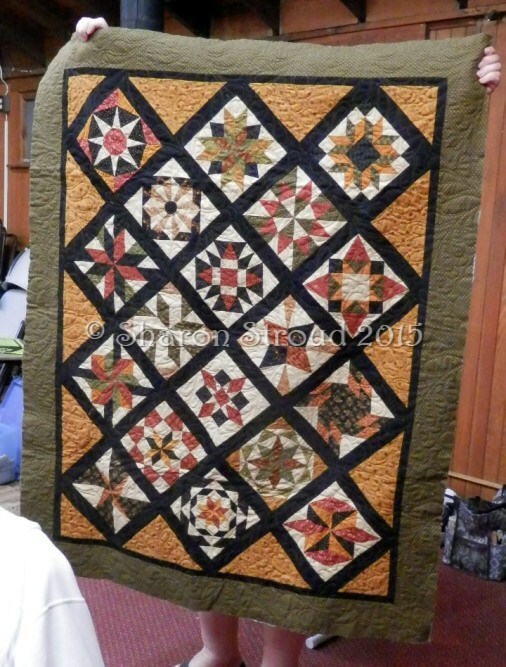 Civil War reproduction fabrics are stunning in this design. 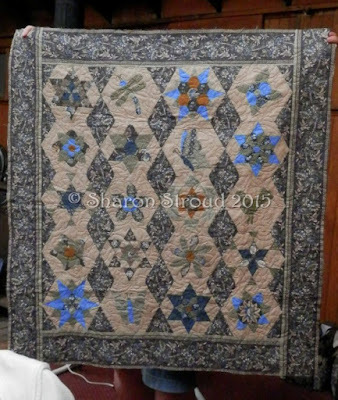 Note the border! And Emily's second "not" is Monthly Bliss 1. The setting fabrics are perfect for making those hand-pieced stars shine. Gale's version of Mariner's Compass Bliss. If you look carefully you will see that all of the background is not the same. 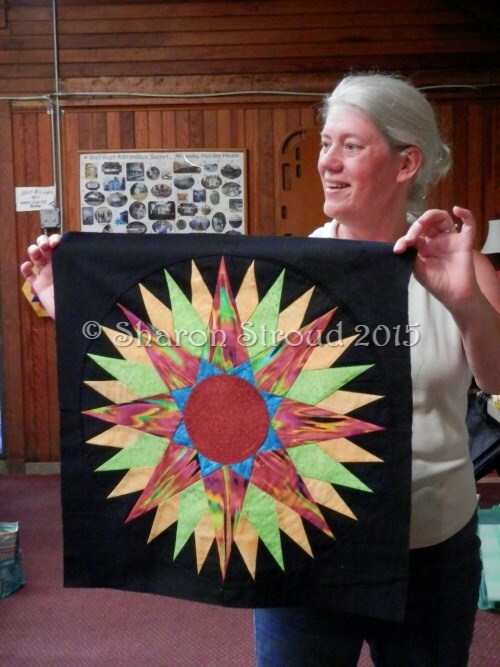 Gale chose to use a few similar backgrounds to give the quilt more depth and to look like "black holes". Just stunning. And Gale finished her Monthly Bliss 3 flimsy. 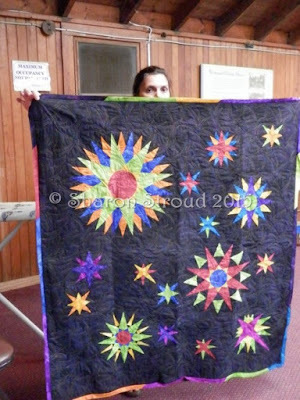 The blocks are hand-pieced, and the setting fabrics are well-chosen to support those beautiful blocks. And last for tonight, but never least, is Traci with her "not". 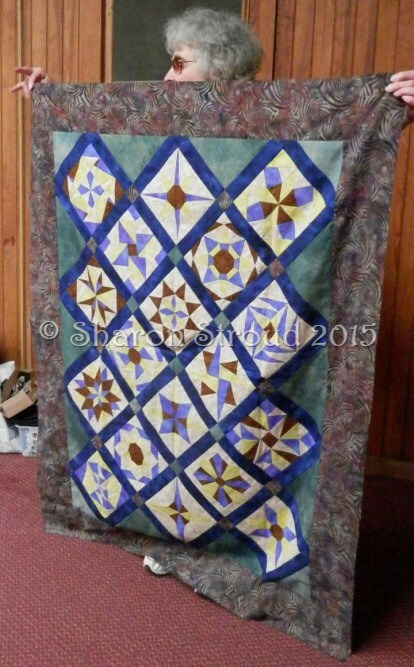 This is Mariner's Compass Bliss, with hand-pieced blocks. Traci longarmed this herself, and I love the multi-colored binding! Thank you, ladies, for sharing and for giving me even more reason to be proud of my students. You are the best! For those of you who are wondering what all the "Bliss" is about.... In my humble opinion, something good should happen to women at least once a month (we all have lots of not so great things that happen every month), so I started teaching long-term block of the month classes and named them all with Bliss in the title. I have Monthly Bliss 1, Monthly Bliss 2, Monthly Bliss 3, Hexagon Bliss, Monthly Bliss Doubled, and Mariner's Compass Bliss. 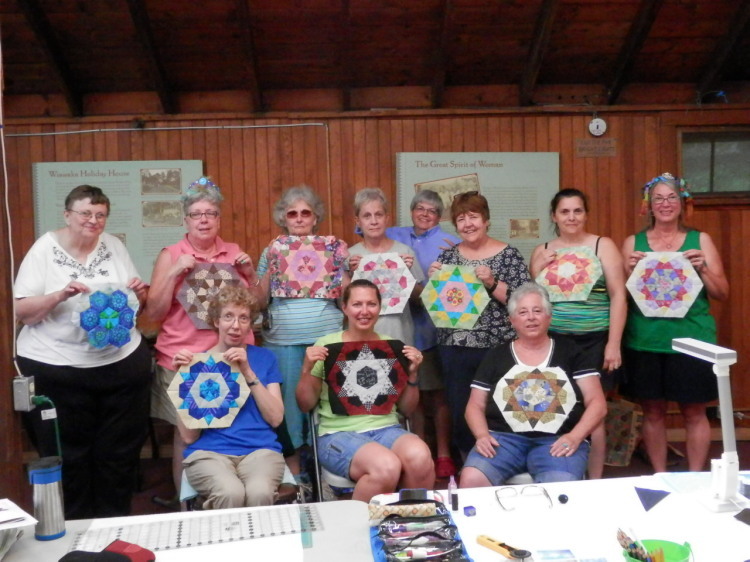 All hand-pieced, and some are even set by hand! 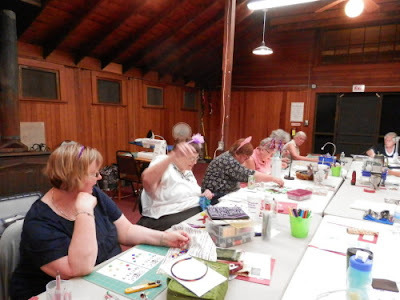 One of my students said we should be called "Bliss-ters", not to be confused with blisters which are very bad. Our bliss is excellent! I'm not exactly sure where the summer went, but it went too quickly. Stay tuned for more cool stuff! P.S. I am listening to The Husband's Secret by Liane Moriarty.